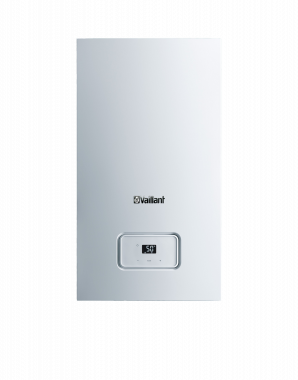 Manufactured by Vaillant, the Home 25kW System Gas Boiler is a highly reliable condensing boiler that will help to make your home more efficient. As a compact wall mounted unit, you’ll be saving that much needed space in your home thanks to dimensions of 740x418x300mm (HxWxD). Featuring a 25 kW output rating, this boiler is perfectly suited to larger homes with a higher demand for heating and hot water, as well as homes with multiple bathrooms. Also available in a range of other outputs, such as 12kW, 15kW, and 18kW, there’s likely to be a boiler to suit the heating and hot water demands of your home. The high efficiency of this unit is shown through its ErP A rating and 93% efficiency, as well as having a SAP efficiency of 89.3%. This boiler also comes with a wide range of other features, such as having a SAP performance up to 4% higher than normal boilers, it also features a modulation up to 1:5 for increased efficiency, a fully modulating low NOx burner and a no-fill condensate trap. The unit also comes with a contemporary design that has a bright interface and a choice of homeowner controls, giving you maximum control over your heating. As this is a System boiler, it directly heats your central heating system and hot water from a storage cylinder. Most of the important parts of the hot water and heating system such as the pump and expansion vessel are built in on a System boiler, making it quicker and cleaner to install. This also means that you get a faster response to demand for heating and hot water, plus you don't need to have a feed and expansion tank in the loft. Available with a 2 year warranty, you can get this boiler installed with peace of mind that it won’t be letting you down.